Differential Pressure Transmitters are 2-wire transmitters. These are loop powered devices with 4-20mA current loop protocol as the standard. The lower range is 4mA, and the upper range is 20mA. The difference between lower range and upper range is called span of the transmitter. 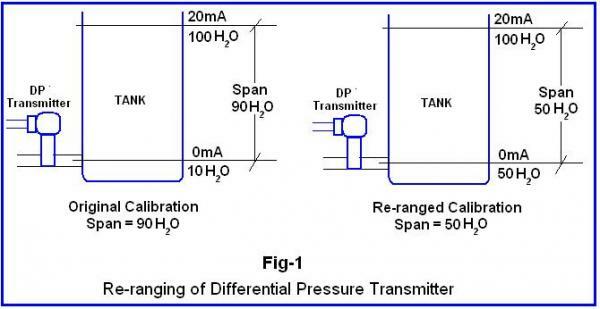 The span requirement of the application pressure range is to be matched to the transmitter span. The transmitter reading is most accurate when it uses most of its span during measurement. Let’s explain this phenomenon with an example. Say, the 4 and 20mA points of a DP Transmitter are set to 0 and 100H2O as original calibration (Please see Fig-1). In this case, the span will be 100 ­ 10 =90H2O. Now there is some change in the process and the process pressure requires the minimum to be 50 H2O. In this case, the minimum- 0mA is to be Re-range to 50 H2O. Once this re-ranging is done, the Span will also change to 50 H2O.